FATAL ACCIDENT. – An accident by which one man was instantaneously killed occurred at the Tay-bridge on Wednesday evening. While a span was being lifted to the top of two piers one of the chains used in hoisting it snapped. Immediately the huge piece of iron, which weighed 25 tons, was released, the chain suspending the other end gave way, owing to the sudden jerk. In its descent into the river, from a height of 50ft., the span struck one of the workmen named Bain and killed him on the spot. Besides the pecuniary loss, which is considerable, the accident will have the effect of interrupting the progress of the works, which were proceeding most satisfactorily. The engineers are, however, confident that, notwithstanding what has happened, they will be able to complete their arrangement with the Tay Bridge Company to run a train over the structure on the 15th of September next. A longer article, again from The Engineer (28 September 1877 (p228)) describes dignitaries having a first ceremonial train ride across the two miles of river. The line wouldn’t be open to the public until the station was completed a few months later. THE TAY BRIDGE – On Tuesday the Tay Bridge was virtually opened for traffic, that is to say, a long train containing many of the directors of the North British Railway and other gentlemen, was run across the bridge from the south to the north side. A great concourse of people was present to see the Tay crossed by a railway train. The connecting works are not yet complete, but in a very short time all will be ready for Board of Trade inspection, and the bridge will then be opened for traffic. An elaborate description of this bridge, fully illustrated will be found in THE ENGINEER for April 4th, 1873, and to this we must refer such of our readers who are desirous of complete information concerning the longest railway bridge in the world. But a few general particulars concerning the structure, and a glance at its history, will not be out of place here. The bridge has been constructed to carry the traffic of the North British Railway across the estuary of the Tay at a place where it is nearly two miles wide. It was designed by Mr. Bouch, C.E., and a bill was obtained in 1870 for its construction. Messrs. De Bergue and Co., of London, obtained the contract for it in 1871, and the foundation-stone was laid in the land abutment on the south side on the 22nd July of the same year. In May, 1874, the death of the principal partner of De Bergue and Co. led to the transference of the contract from that firm to Messrs. Hopkins, Gilkes, and Co., Middlesbrough, by whom it has since been prosecuted and finished. The bridge begins about a mile and a half above Newport, on the south side of the river, where the depth of water at high spring tides is 45ft., the velocity of the current reaching occasionally five knots an hour. The design includes eighty-five spans, varying in length from 67ft. to 245ft., those of the greatest dimensions being placed over the navigable part of the river. Here the bridge has a clear height of 88ft. above high water, from which it slopes down to the Fife side with a gradient of 1 in 356, and towards the Dundee side where it takes a curve to the eastward in order the more conveniently to join the land line, with a gradient of 1 in 73. We must refer our readers to THE ENGINEER for April 4th, 1873, for a description of the method of erecting the bridge adopted by Messrs. De Bergue. After the work had been in progress for some time on this system, it was found that the rock suddenly shelved away to a great depth under beds of clay gravel, and sand. It therefore became impracticable to sink the piers to that foundation, and a new method had to be introduced. The weight of the pier was lightened by substituting in the upper works iron columns for solid brick, while the adoption for each pier of a single oval cylinder measuring 23&frac12;ft. by 13&frac12;ft. secured a larger bearing than had previously been obtained with two smaller ones. 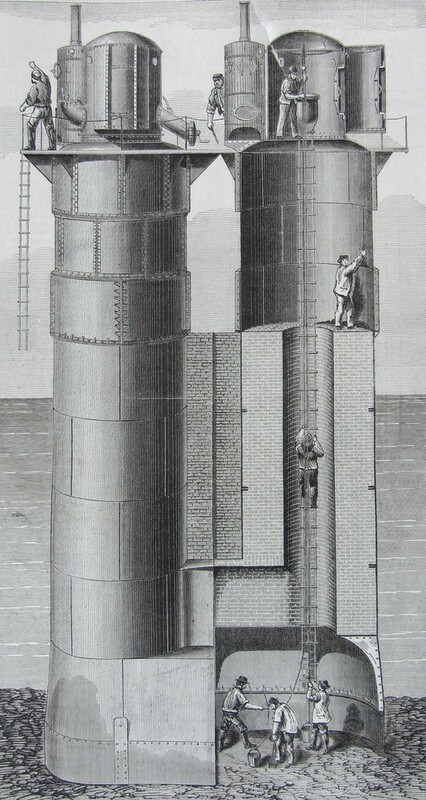 The cylinders, constructed on shore, were floated out to their places, and sunk by the aid of an ingenious sand pump invented by one of the assistant engineers, Mr. Reeves. 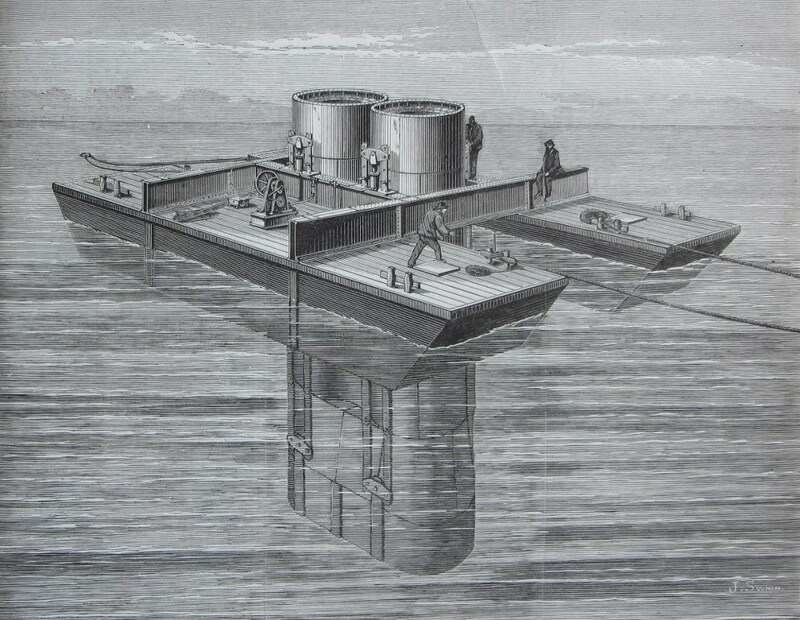 The interior of the cylinder was afterwards filled to the top with cement concrete, and the portion above the bottom of the river being removed, on the concrete was placed a base for the pier constructed on shore and floated out. This reached to the level of low-water, and on it, as the tide permitted, men worked at the erection of the next section which reached to high-water mark, where four courses of stone were fixed. On these were placed the iron columns, 12in. and 15in. in diameter, carrying the girders. When the piers had been brought up to the proper height, the girders – measuring 245ft. in length, and weighing 190 tons for each span — were towed out. The raising of the girders was carried on in lifts of 20ft. at a time by hydraulic apparatus. Two girders, connected by transverse braces, go to each span, the depths varying according to the width of the space to be crossed. The length of the spans diminishes in going towards the shores on either side of the navigable channel, the depths of the girders being correspondingly decreased, the minimum being 12ft. The bridge has been calculated for a rolling load of 1&frac12; ton to the foot run. The bridge is connected with the main line of the North British Railway by a branch striking off at Leuchars Junction, and running up to the south end of the bridge, the distance being about five miles. 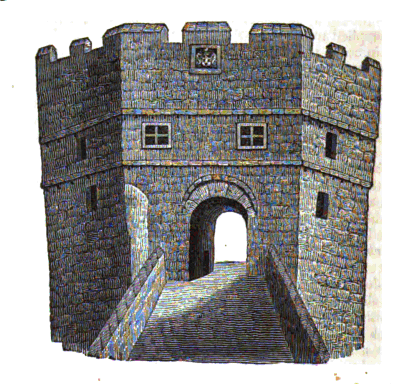 The tower on the bridge was a place of temporary confinement for disorderly persons. There was a stone with the town’s arms on it, placed on the south front, with the motto Ffortiter defendit triumphans , 1646. This stone was also preserved by Alderman Hornby, and placed in his garden-wall. The house and garden is now the property of Anthony Clapham, esq., who has paid every attention to the preservation of these relics of the old bridge; having built upon the garden ground, the stones are placed in the wall over two office doors. 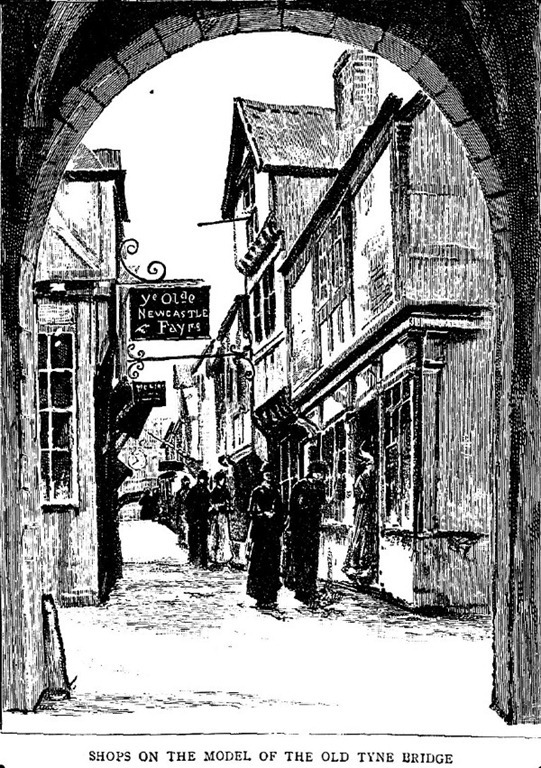 The above cut is taken from an original drawing, in the possession of Miss Hornby, daughter of the late Alderman Hornby.